Neon Genesis Evangelion Wallpaper: Hello? 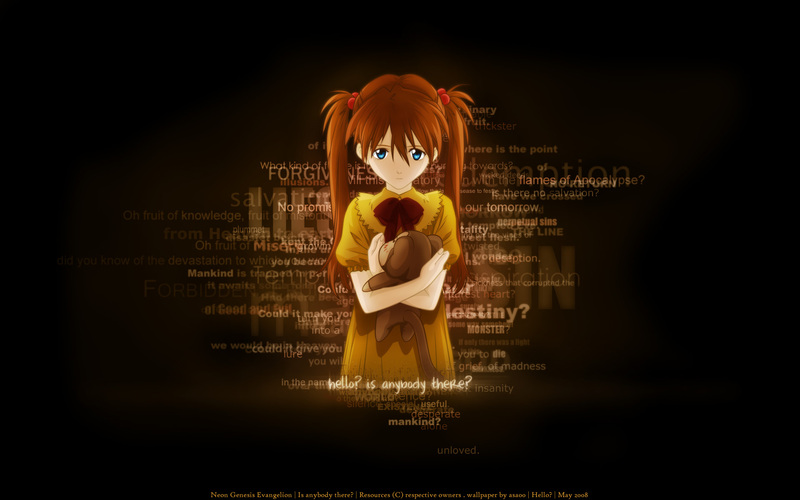 Minitokyo »	Neon Genesis Evangelion Wallpapers » Neon Genesis Evangelion Wallpaper: Hello? i read evangelion and it left an impression. this image was originally the black and white cover for stage 60 of the manga. i walled it because of how well it communicates asuka's vulnerability. the warm colors were deliberately chosen to make her blue eyes stand out. i also did quite a bit of lighting work with glows and and shading to strengthen the lighting from my original vector, which is nothing fancy. nicely and the vector job is great on her. with the light coming from behind the words. I never watched this anime, but I know there's something creepy about this girl. Amazing vector and nice composition. Great Wallpaper, Love your work. I have a soft spot for text that is well-placed and this is good. I love the color theme, makes it seem like Asuka is a candle in the dark. Wait...that sounds wrong, but you get what I mean, right? ^^; Anyway, good job with the wallie! Indeed.. the blue eyes are capturing my attention! o_0 Thanks for sharing. The vector of Asuka is truly great, I really like different colored outlines and I have to try that out myself sometimes. Nice composition and color scheme and did I mention that I love the vector XP. Beautiful girl,but she looks sad. i think she needs a hug..
yup i totally agree that it shows her vulnerability! thanks a lot for the wallpaper! Great Vector of young Asuka. And this Darkness and Writings + Effects resemble here Lonlyness and inner conflicts really good.